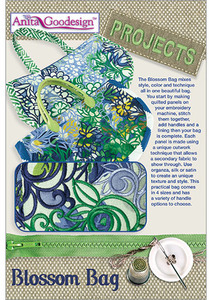 The Blossom Bag mixes style, color and technique all in one beautiful bag. You start by making quilted panels on your embroidery machine, stitch them together, add handles and a lining then your bag is complete. Each panel is made using a unique cutwork technique that allows a secondary fabric to show through. Use organza, silk or satin to create a unique texture and style. This practical bag comes in 4 sizes and has a variety of handle options to choose. 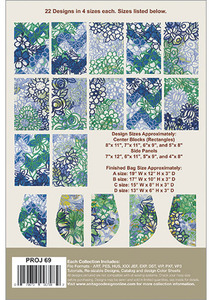 Design Sizes Approximately: Center Blocks (Rectangles) 8"x 11", 7"x 11", 6"x 9", and 5"x 8". Side Panels 7"x 12", 6"x 11", 5"x 9", and 4"x 8".